Bring a large pot of generously salted water to a boil. Drop the beans into the water and let them cook for 3 minutes until they start to become tender. Drain the beans in a colander and run cold water over them to stop the cooking and preserve the color. Peel the Clementines and cut each segment in half crosswise. Cut the cooled beans in half cross wise. In a small bowl or container combine the olive oil, vinegar, shallots, mustard, thyme and salt and pepper. Whisk or shake to combine. 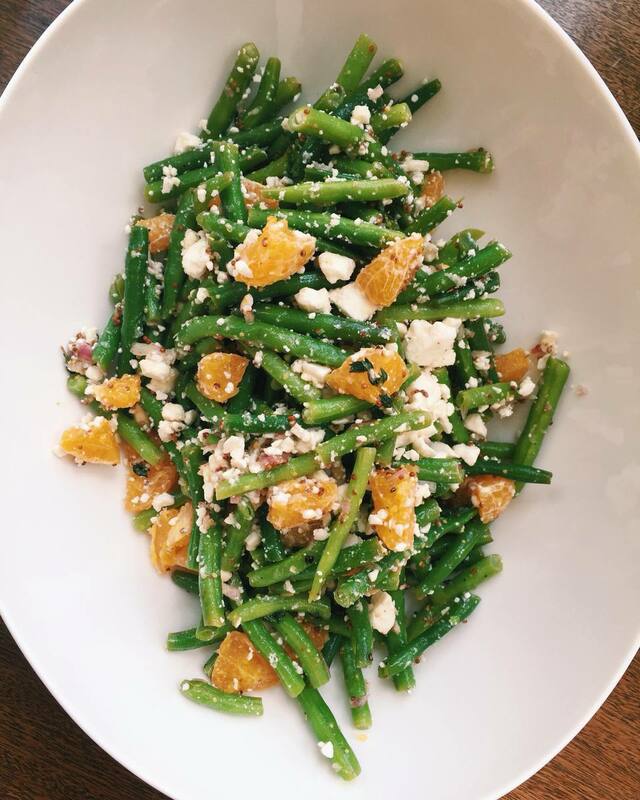 Place the bulgur whaet, green beans and orange segments in a large bowl and drizzle over the dressing. Toss to combine thoroughly. Add the feta and toss again gently to combine. Serve at room temperature or chilled. "Bulgur wheat is a whole wheat grain that has been cracked and partially pre-cooked. As a whole grain, it is a naturally high-fiber, low-fat, low-calorie vegetarian and vegan food ingredient. Because it is a wheat, bulgur wheat is not suitable for those on a gluten-free diet. Though bulgur wheat is most commonly found in tabbouli (tabbouleh) salad, you can use it just like rice or couscous, or any other whole grain, such as barley or quinoa. Most types of bulgur wheat will be done cooking in less than just fifteen minutes. There are two main kinds of bulgur wheat: Instant bulgur wheat, also called fine-grain bulgur is common in health food store bulk bins and is usually used for tabbouli recipes. This type of bulgur cooks in less than 5 minutes. Medium grain and coarse grain are also available. Wondering just how healthy bulgur wheat is? According to CalorieCount, one cup of cooked bulgur wheat provides 151 calories, 0.4 grams of fat, 8.2 grams of dietary fiber (that's about 33% the recommended daily value), and a healthy 5.6 grams of protein. Bulgur wheat is also naturally cholesterol-free food."